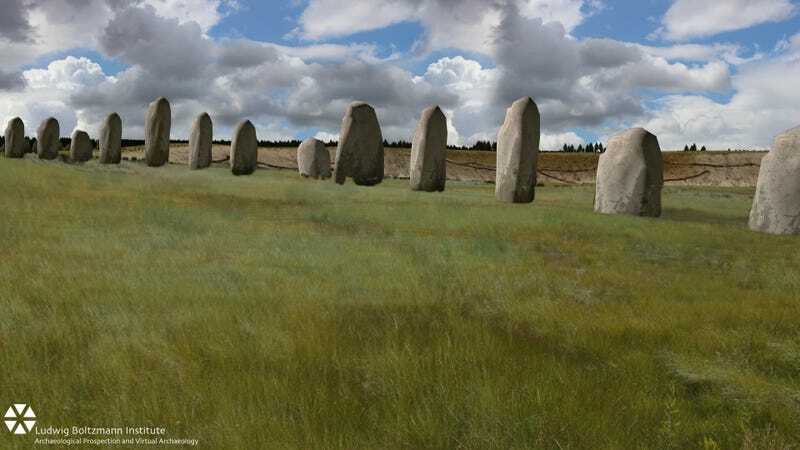 Last year, archeologists announced the discovery of the Durrington Walls “superhenge,” a remarkable structure located just two miles from Stonehenge. The same team have now found evidence of an even older structure at the site—a ritual arena comprised of over 90 megalithic stones. Constructed some 4,500 years ago, Durrington Walls is one of the largest known henge monuments. It measures 1,640 feet (500 meters) in diameter and features a total circumference of 4,920 feet (1,500 meters). The structure is associated with a recently excavated Neolithic settlement that appeared some time later. Using ground-penetrating radar, the Stonehenge Hidden Landscapes Project team, which includes experts from Birmingham and Bradford universities, has now discovered an even older structure at the site—a 1,080-foot-long (330-meter-long) row of up to 90 standing stones, some of which stood as high as 15 feet (4.5 meters). The stones were discovered 3-feet below the surface of a bank at the Durrington superhenge site. Based on the c-shape configuration of the structure, the archaeologists suspect that the site was used as a ritual arena. The impressive row of looming monuments was likely built to give the impression of authority to both the living and the dead. The stone line may have also marked a ritual procession route. Though no stones have been excavated, it’s thought that the stones came from local sources. According to project leader Wolfgang Neubauer, a number of stones survived after being deliberately pushed over, where they were eventually incorporated into a massive bank. “The extraordinary scale, detail and novelty of the evidence produced by the Stonehenge Hidden Landscapes Project, which the new discoveries at Durrington Walls exemplify, is changing fundamentally our understanding of Stonehenge and the world around it,” noted project historian Paul Garwood in a release. “Everything written previously about the Stonehenge landscape and the ancient monuments within it will need to be re-written. This discovery suggests that Stonehenge’s neighbor, Durrington Walls, featured an earlier phase of Neolithic habitation and monument-building—one that included a large row of standing stones. The team’s research will be presented later this week at the British Science Festival in Bradford. Email the author at george@io9.com and follow him at @dvorsky. All images by Ludwig Boltzmann Institute.